The tutorial describes how to integrate dhtmlxGrid and dhtmlxScheduler in a Yii application. You’ll learn how to bind the grid and the scheduler to the database and update data on the server when user makes changes on the client side. The integration with Yii will be done through the dhtmlxConnector layer, which handles client-server data communication. This tutorial gives step-by-step instructions but it is assumed that you have the basic knowledge of the Yii framework and the DHTMLX library. Download the files of the final demo and keep reading to learn how to use DHTMLX with the Yii framework. Before continuing, make sure that you have Yii installed on your computer. If you don’t, refer to the installation guide to learn how to do it. In the root folder of your app, create a sub-folder with the name ‘DHTMLX’. 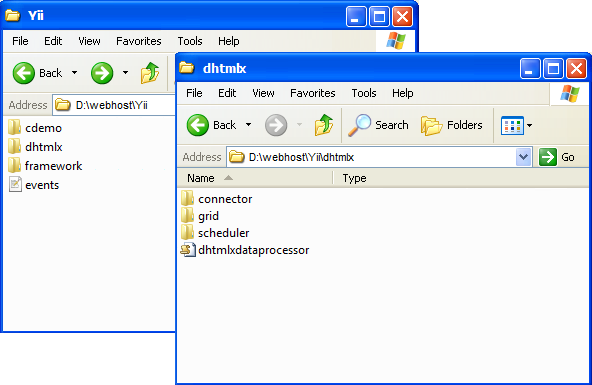 Add the required JS/CSS files of dhtmlxConnector, dhtmlxGrid, dhtmlxScheduler, and dataProcessor (included in both dhtmlxGrid and dhtmlxScheduler packages) to the ‘DHTMLX’ folder, or simply copy the folder with the required files from the final demo package (find the download link above). In our demo Yii app, we use the events database. You can create a local copy of this database by importing the SQL dump file events.sql (find it in the root folder of the final package) or you can just use any available database. Note that if you use your own database, you will need to adapt the code examples by yourself. To connect our web application to the database, we need to create a model class. You can make it by using the built-in web-based code generator Gii. For more details of generating a model class, read Creating Your First Yii Application article in the Yii documentation. The newly created Events model class allows us to access the backend database ‘events’ table, which stores our data for the grid and the scheduler. Note that we’ve also added the connector files for the scheduler, which will be required for the scheduler integration described below. If you don’t plan to use the scheduler in your app, just do not include the file ‘scheduler_connector.php’. You can see the resulting EventController.php file in the demo package. This file processes all the operations with data (add, edit, remove records) and saves the changes made by user to the database on the server. It’s a standard code that initializes dhtmlxGrid on a page. If you have already worked with the grid component before, it won’t be difficult for you to understand the code. If anything is not clear, refer to the grid documentation. When the grid.php file is ready, run webhost/cdemo/event/grid. The page should now display the grid filled with data from the server-side database. The grid is editable and all the changes you make in grid are saved to the database. Again, we used a standard code that initializes the scheduler component. For a deeper learning of dhtmlxScheduler initialization, read the documentation. Now, if you run webhost/cdemo/event/scheduler, you should see the scheduler that loads data from the ‘events’ table in the database. The same as with the grid – all changes made in the scheduler are saved to the database. Users can create, modify or delete events, and the data in the database will be updated automatically. That’s all. We now have a Yii demo application created with dhtmlxGrid, dhtmlxScheduler, and the dhtmlxConnector library. We have integrated editable data grid and scheduler that can update the database table when user make changes on the client side. The application logic was not the goal of the tutorial but we hope that this example will inspire you to create fully functional web apps with DHTMLX and Yii. Download the demo files and get a closer look to the integration approach. Thank you for this tutorial. This is exactly what I needed. This is what I have been searching for on the internet to get something that is easy to integrate in YII structure. I want to developer a school management application and this tutorial has just nailed it. I know we have other js framework but they do not plug in YII as this one. Am going to start developing my app now using this library. Great that these library components can be used with Yii. Couple of things that I ran into that might help others when going through this demo. Simon, thank you for your pointing out these issues. This will be fixed in the future release of dhtmlxConnector. Great Work and I loved this. I will sure to use this and try in my project. Thanks for your grateful PHP Tutorial informations. I have installed DHTML PRO (eval) successfully and I have been able to run the Yii framework connection example (cdemo). I have then created a grid within my applicaton in Yii and again this works fine. I have modified the grid to test checkboxes, calendars, date and number formatting and all works fine. I am now trying to use combo box inside a column but as soon as I change the “ed” editor type to co or coro or combo I have an error, can anyone please help. Can you please help? Tx! Thank you Ivan, I’ve done it and Stanislav came back with suggestions that I am going to try soon. Thank you for really great lib! Scheduler connector work fine but when I trying use units or matrix view I can’t set sections. Seems “typeid(value),name(label)” syntax work only for pure mysql but phpyii. May be there is a workaround of this issue? Andrei, the issue has been confirmed. We’re trying to find a solution for this problem. Thanks for the great library and documentations. I tried to use the demo application as follows. 01. Download and extracted to htdocs directory. The application loaded without any problem. Then I clicked on the link ‘Grid’. It redirects me to localhost. Then i accessed those pages by manually typing the address. But unfortunately the grid or scheduler not loaded. I checked the results with firebug and it says following errors respectively. I am using xampp with php 5.2. It’s highly appreciated if anyone can help me to find the issue. If you have run the app from some sub-folder, not the root of web-server, then the paths to js file will be invalid. Thank you very much Ivan. Now it’s work like a charm. Thanks for the help and the great library. Is it good that .js scripts go in body (not in head) section? I don’t know does it important, but right now i include 12 .js files in view for dhtmlxGrid… and feel that it is just a beginning. You can include a single dhtmlx.js (grab dhtmlxsuite package from the site) which includes all functionality. Also, you can include script tags in head section of course, there is no any limitations here. It doesn’t work for me. can you please see my question in forum and give me the fix as soon as possible. Please see our replies in the forum. I tried to follow the mvc pattern as you show in this tutorial using a dhtmlxLayout to display the main application interface, but I cannot figure out what are the steps to work respecting the mvc pattern with a layout. The only way I can guess is to declare all the interface logic in the main index files. Do you know a more “mvc way” to do it? Can you provide a tutorial for yii and dhtmlxlayout in the future? Claudio, unfortunately there is no a better (more MVC) way to use dhtmlxLayout. I found a problem with dataprocessor, I had troubles to insert and update rows that have non a numerical “ID” containing underscores. I solved it modfying the code of “dataprocessor.php”. I think it may be a problem for more than a few users. I write it here because I’m not a licensed customer of dhtmlx and cannot submit support/bug tickets. What about dhtmlxGantt? I know that I can probably provide the JSON necessary, but is there an integration of Yii + dhtmlxGantt example? Unfortunately, there is no a ready example of dhtmlxGantt with Yii. We may prepare one in the near future. How do I get the TimeLine View working with Yii. My Events model is relational which means that there are entries in related tables that are required for my scheduler. I’ve just spend the whole evening creating a actionScheduler_data_wrapper() in EventController.php that modifies the data before it passes it to actionScheduler_data(). I’ve now got the event_name in a different (and linked) table. It’s a massive hack and I had to rewrite the GET functionality to make it work and remove some of the “die”‘s from your library. Are there any plans to make this easier? When working with YII, you are providing the model object to the connector. You can define your own implementation for findAll method on the model, that will hide all inner complexity. In such case there will be no need for changes in connector’s code. I’ve been following it and have gotten pretty far but I’m using Yii2 and Gii. I’m receiving an error message. hello, if you achieved integration with Yii2, I’d appreciate a lot if you share. Greetings and thank you very much.